Model 1700/2400-3000 Series Feeders for Forging — Feedall designs and manufactures a complete line of hopper and bar feeders specifically for forging applications. Our feeders automate billet heating equipment and direct press cold forging applications. Capacity of a forging feeder ranges from 3/4” to 6”, with the ability to feed a wide variety of shapes. 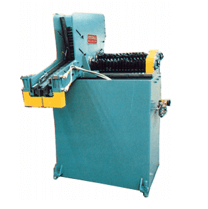 Feeds hot rolled steel bars from a manually stacked floor mounted magazine. The bars are escaped rolling from the magazine one at a time to the customer’s conveyor.